Kalibiru National Park is located at Menoreh Mountain, Kulonprogo Regency, Yogyakarta. The rolling hills host thick green forests with over 7 km trekking tracks. It wasn't always like this before. In the past Kalibiru was a barren and arid area. Trees are gone due to political instability which leads to unsupervised burnings and illegal logging. It was not until the year 1999 when the local community took an initiative for a reforestation effort. The effort back then sponsored by the government. It took years for the trees to grow tall as it used to be. But thanks to this effort, now everyone can enjoy a green forest that once was a perished dream. Later, Kalibiru officially announced as tourism spot in 2008. Kalibiru National Park has since managed by the local residents of Kalibiru Tourism Village. It's a popular destination for vacationers looking an escape from the big city. Since Kalibiru is located 450m above the sea level, the air is cool and clean. 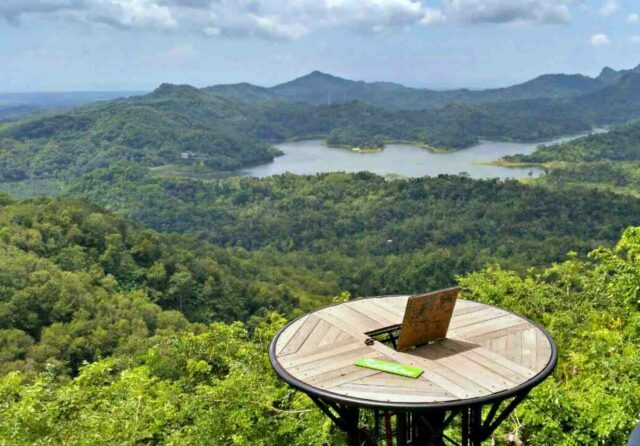 From the viewpoint, tourists can take a glance to nearby Sermo Reservoir, an artificial lake serving as irrigation and water source for Kulonprogo Regency. 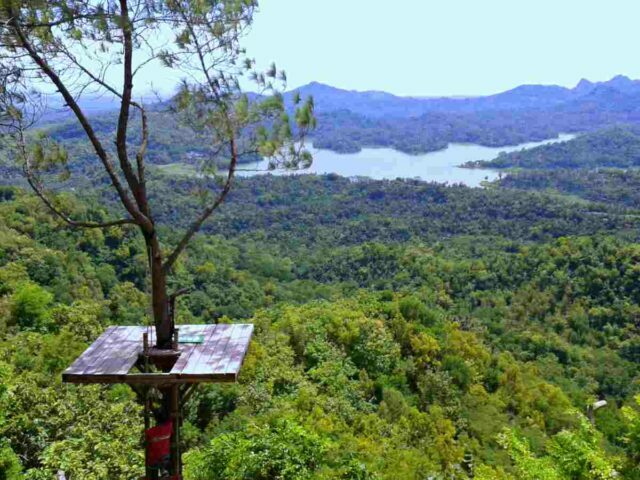 Kalibiru is famous for a seemingly endless row of trees surrounding Sermo Reservoir. The Sermo Reservoir sits in the south, its surface glistening like a pearl, reflecting the sunlight. Far behind, a white line shows the waves of the South coast's beaches. In good weather, expect a glimpse of the notorious Mount Merapi in the north side. All of these spectacles are nothing but remarkable. Nearing dawn, head to Kalibiru's iconic viewing deck, a gazebo with traditional joglo design. This is the best spot to hunt for sunset. Wait as the time creeps into the evening, and then watch the sun making its way down before disappearing into the horizon. The sky turns from orange to red to purple, all colors stacking to each other creating an incredible painting only nature can create. It would be a shame leaving this scenic place without capturing some social media-worthy photos. Queue among eager visitors to snap a picture at one of the photo spots. The photo spots at Kalibiru National Park are basically wooden platforms located on strategic vantage points. Some are built on tall trees, others are built on the edge of a cliff. 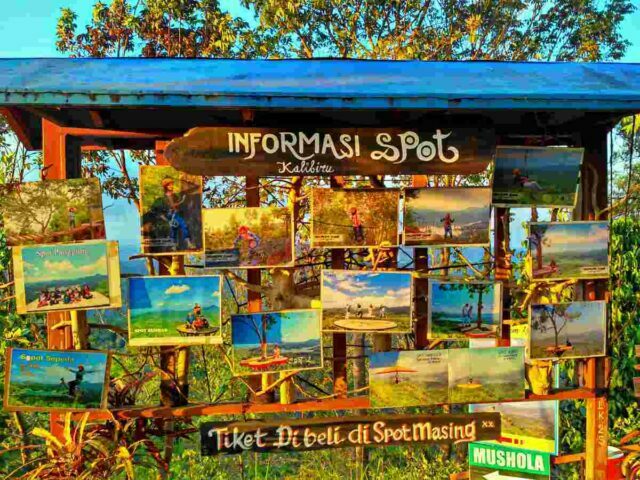 Photo spots at Kalibiru National Park are not free, visitors will need to pay an additional fee. But if the resulting are heavenly pictures. As if floating mid-air surrounded by wonderful greenery, no one would complain anyway. Photo spots cost starting from IDR 10,000 for a 5-minute photo session. The thick forest of Kalibiru invites hungry adventurers to reveals its beauty. Not only that the trekking route is well-maintain in order to make the adventure easier. But it also comes with several options. Opt for the shortest track if visitors want an easy stroll. The shorter route is only 2-3 kilometers. The longer track is about four to seven kilometers long. Do make a stop at Sermo Reservoir. Because the trek passes through this beautiful artificial lake. Rest on the lakeside while watching locals do some fishing. There are also plenty of photo opportunities at Sermo, so do not forget to snap some photos before leaving. Spice up the peaceful Kalibiru National Park visits with a little bit of excitement. There are plenty of outbound activities. Rent an ATV or a Jeep. And have an off-road exploration through the Menoreh Forest. 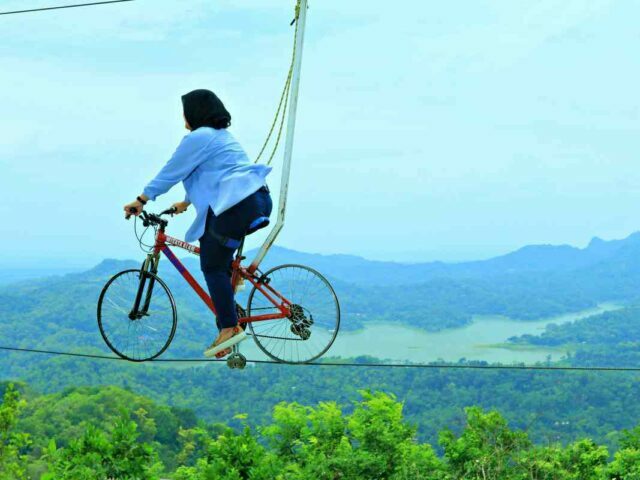 If the idea of swaying high above the ground interest visitors, then do not miss the adrenaline bridge. The adrenaline bridge is a sky bridge made from wooden planks tied together with a rope. It’s shaky and scary at first, but try to distract the mind with the scenery while crossing. In no time, visitors will get to the other side. Other activities to do are the zip-line, spider web (rope-climbing), and the death swing (a swing in a cliff-side). The national park opens from 6.30 AM to 6 PM. The photo spots are especially popular during weekends, so it's better to visit on weekdays to avoid the long queue. 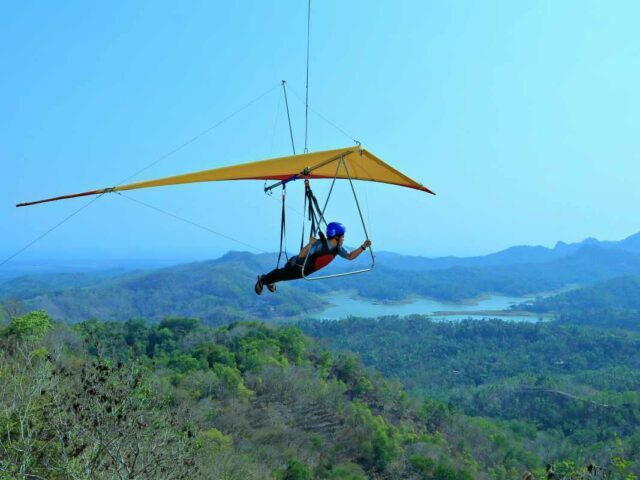 See: Experience The Extreme Gondola in Timang Beach, Yogyakarta. The entrance fee to Kalibiru is affordable. It is IDR 5,000 on weekdays and IDR 10,000 on weekends. Some photo spots and other outdoor activities require other extra bucks. See: Caving and rafting in an underground river, Pindul Cave. 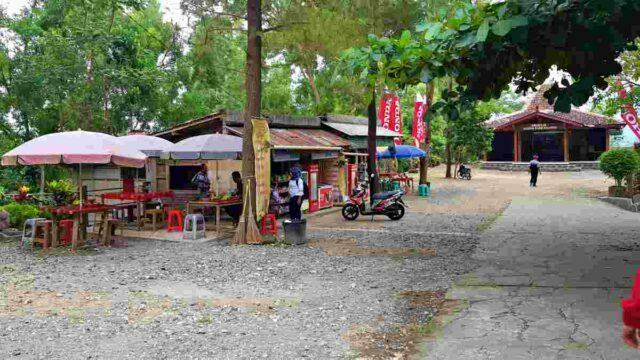 Facilities at Kalibiru National Park is pretty basic, such as toilets and parking space. There is a free WiFi service near the entrance. Food vendors are plenty, so no need to worry about running out of food supplies. For accommodation, there are plenty of hostels and guesthouses at the village nearby. Rate is as cheap as IDR 120k per night. Kalibiru National Park is a 45-minute drive from downtown Yogyakarta. There are many options to go to Kalibiru National Park. The most convenient is by renting a car. Starting from IDR 400,000 for a day trip, visitors can get a 6-seated van including a driver. The cost can be cheaper if there are more people renting the same car (shared car). Tourists preferring public transport can take Trans Jogja Bus to Giwangan Bus Station. At Giwangan, get into a bus heading for the City of Wates. After stopping at Wates Bus Station, it's still 10 km left to the national park. From here on, continue the journey to Kalibiru using a motorcycle taxi.